When I create I new model, I always create the model in the design software at full size. I know that the minimum printable dimension for something printed at Shapeways is 55mm. This scales down to just a fraction over 0.7mm when reduced to OO scale and just under 0.4mm when printed at N scale. 0.7mm is the minimum for printing in Shapeways “Strong White and Flexible” and 0.3mm is the minimum for printing in Shapeways more expensive “Frosted Ultra Detail”. While the material is more expensive for N Scale the volume of material to be printed is about1/4 of OO scale. What all this means is that anything that can be printed in OO scale can also be printed in N scale using the same design model; and printed at a cheaper cost. The only reason why there is currently more OO scale stuff available here is that my own modelling is in that scale and I have been too lazy to rescale the files to the smaller scale. I will get there when time permits. If there is anything that you would like printed to another scale, just leave a comment here, or send me a message through the contact page. 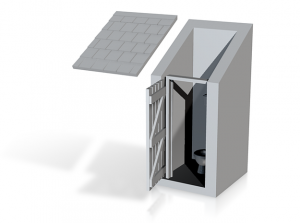 Today I re-scaled the Outdoor Privy to N scale. 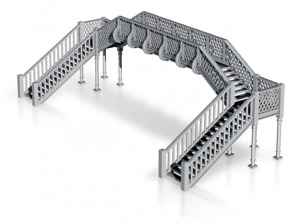 The lattice footbridge has been available in the smaller scale for some time and is a popular item and very reasonably priced. I need an assortment of chimneys for my scalescenes buildings in N Gauge, when will you be making them available? also what cost?